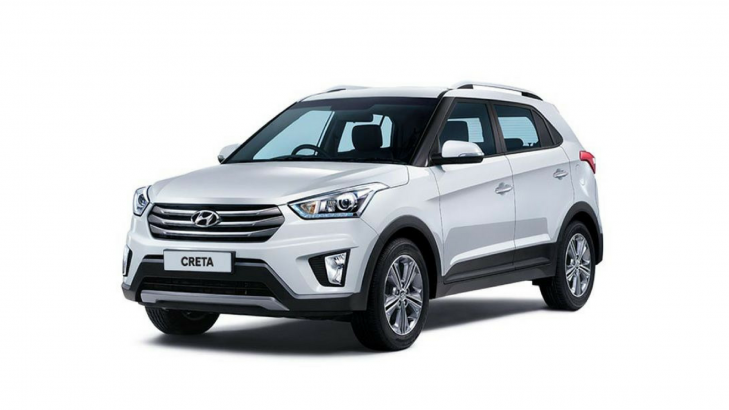 Hyundai Creta is one of the most arresting urbane SUV in the utility segment. Launched in India in the year 2014, the sporty looking SUV has been munching large sales numbers and easily finds itself in the list of most successful cars by the South Korean carmaker in the country. India’s best selling SUV — Hyundai Creta commands a bold appearance from the outside and receives premium interiors inside. Besides being feature packed, the above 4-metre Hyundai SUV also gets frugal engine choices namely — one petrol, two diesel. The Hyundai Creta, which dons Fluidic Sculpture 2.0 design ideology, is offered in as many as six trims and seven shades, out of which two are dual shade choices. The base variants of Hyundai Creta that is the E and E+ are equipped with radial tubeless 205/65 R 16 tyres and steel wheels. Moreover, the mid variants, S and SX are shod with radial tubeless 205/65 R 16 tyres and clean silver alloys. The top end slot that comprises of SX AT, SX Dual Tone, SX (O) feature larger 215/60 R 17 tyres and diamond cut alloy wheels. As spare tyre E, E+, S, SX variants come with 205/65 R 16 steel wheel, while the 215/60 R 17 steel wheel feature in the SX AT, SX Dual Tone, SX (O) variants. Prior to the launch of Hyundai Creta, the urban SUV segment in India was craving for something above or in-line with the likes of a Renault Duster. And with the advent of Creta the above 4-metre segment got a new lease of life. With its capable and unique stance, the South Korean SUV lock horns with Maruti Vitara Brezza, Renault Captur, Nissan Terrano and Renault Duster. To lend a young and vibrant appeal to the macho SUV, the Hyundai Creta is offered in two dual-tone shade options. The modern SUV is garnered with numerous impressive elements inside and outside. Thanks to the V2.0 of the fluidic philosophy, the overall exterior design gets excellent aesthetics at the front, sides and rear. The outside comprises of imposing front grille with cascade design, swept-back bi-functional projector headlamps, LED DRL fog lamps, gutsy appearing front and rear skid plates. Some more elements include chrome finish door handles, shark fin antenna, side body cladding etc. The spacious cabin of the Hyundai Creta, which can easily seat five adults, is hard to go unnoticed. The premium interior characteristics come as first in segment Smart Key Band and Auto Link, 17.7 cm touch-screen AVN system with Android Auto and Apple CarPlay. The cosy cabin also offers plenty of convenient features in the form of sporty interior colour pack, 6-way power adjustable driver seat, cruise control, advanced supervision cluster, 60:40 split rear seats, electrically adjustable ORVM with turn indicators, smart key with push-button start. Moreover, premium attributes consist of a smart electric sunroof, wireless phone/gadget charging, sliding front armrest, leather seats, rear AC vents and many more. To make the Hyundai Creta a safe place for the occupants, it is equipped with numerous protective gears such as Electronic Stability Control (ESC), Vehicle Stability Management (VSM), Hill start Assist Control (HAC), Electro Chromic Mirror (ECM), six airbags (driver, passenger, side and curtain), rear park assist system, reverse park system, speed sensing auto door lock, HIVE body shape for strength and stability. The Hyundai Creta comes with three engines. The 1.6 L, 4-cylinders, 16V, Dual VTVT petrol engine gives out 123 PS of max power at 6,400 rpm alongside a top torque of 15.4 kgm at 4,850 rpm. This engine is mated to a choice of 6-speed manual or 6-speed automatic transmission. The engine offers an ARAI certified mileage of 15.8 kmpl. Furthermore, the 1.4 L, 4 cylinder, 16V, CRDi, diesel engine produces a good 90 PS of max power at 4,000 rpm and 22.4 kgm of peak torque at 1,500-2,750 rpm. This engine is mated to a choice of 6-speed manual transmission and delivers an ARAI validated fuel efficiency of 22.1 kmpl. On the hand, the 1.6 L, 4-cylinders, 16V, CRDi diesel engine with VGT churns out 128 PS of max power at 4,000 rpm together with an utmost torque of 26.5 kgm at 1,500-3,000 rpm. This engine is coupled to a choice of 6-speed manual gearbox or 6-speed automatic transmission. The most powerful of the lot, this diesel powertrain gives out a certified mileage of 20.5 kmpl. Sighting the value that Creta offers the price label is aptly tagged. Hyundai Creta opens with Rs 9.44 Lakh (ex-showroom, New Delhi) and goes up to Rs 15.4 Lakh (ex-showroom, New Delhi) for the top end model. Below is the variant wise price breakdown. All prices mentioned are of ex-showroom, New Delhi. *The above-mentioned tyre brands and variants are recommended on the basis of inquiries received at Tyremarket.com. Prices as on 3rd October 2018.